Do you have a hard time getting started in the morning? So much so that you end up feeling so scattered that you can barely get all the things done you need for the day before you get out the door? Did you know that you can cut your morning routine time down by simply following the same pattern every morning? Your brain makes things routine the more you do them over and over which means you eliminate a lot of the scattered thinking time, allowing you to go on auto-pilot and get through your morning checklist. Here’s one of my favorite tips: If you put your makeup on in the same order every day, you will speed up the process and have time for that extra cup of coffee before you head out the door! The following routine is what I do on a normal day. But please! If it’s a big event, I’ll be in the bathroom for a few hours and it’ll be covered in make-up, bobby pins, and clothes galore! (Why do we girls suddenly forget how to put on eye liner when we are getting ready for a big event? Guess that’s talk for another blog!) Alright, so I first wash my face, moisturize it (I don’t apply eye cream yet) and then start with eye lid primer. This ensures my eye shadow will not crease and stay put regardless of the weather! Next, I curl my lashes, just a hint if you really want a wide-eyed look. Hold the lash curler on your lashes for 30 seconds each side. (But wait! This is a blog about going fast so I can give each side a little pinch and they’ll still get a great curl.) Now, on to the shadow: I first start with a light color underneath the brow bone. I then take my next lightest color and cover my lid with it and then blend it up through the crease and into the lighter color. Next, I take the darker color and put it on the outside corner of my lid and use what is remaining on the brush to do my crease so it is lighter. If I have a little more time, I do the third lightest color in the crease and the darkest on the outer corner but the first way saves time. Finally, blend, blend, blend! Next, I fill in my brows, just a little in those pesky areas that I swear will never grow back. (Hello? Why doesn’t this happen in between your eyebrows!?) Then I swipe a little clear mascara over the top so they will stay put. I apply my eye liner to my upper and lower lid and then follow with my mascara. Next, I take a soapy Q-tip or makeup remover pad and wipe away any excess eye shadow or mascara. Now apply your eye cream because his way it doesn’t get wiped off when you wipe off any fallen eye shadow. Follow this with some face primer with SPF in it or a BB cream and then put concealer under your eyes and on any pimples. Blend it in and then apply bronzer to underneath your cheeks, a bit of highlighter to the inner corner of your eyes and make a “C” starting at the top of your cheekbones, going up over the eyebrow. Blend it all and set with powder if you like a bit more coverage. Next, smile and pop some blush on the apples of your cheeks. Finish with a little lip gloss and you are done! 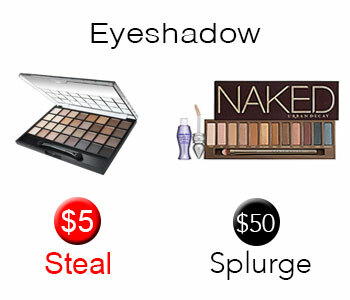 Make sure to check out my favorite steal and splurge beauty products! Enjoy and please let me know if this works for you. Feel free to comment on my blogs with likes, dislikes and anything else you want to read about!